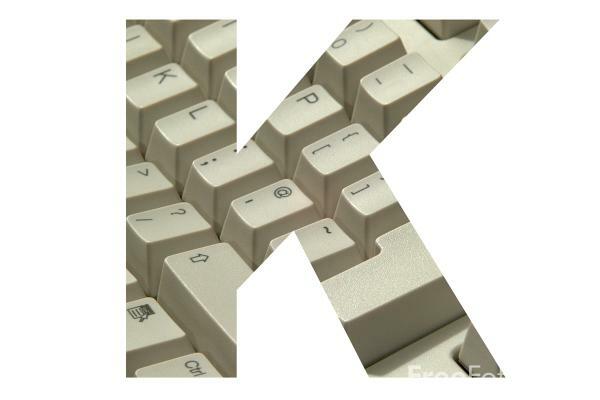 My choice for the letter K is shared between two women writers. 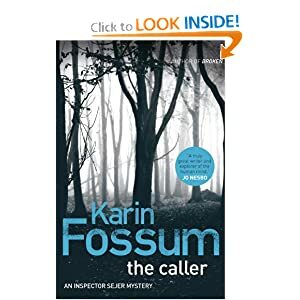 Norwegian queen of crime fiction Karin Fossum wrote THE CALLER which I rated at 5.0. This is #8 in her Inspector Sejer series, and does a lot to show how far reaching the effects of crime can be on the victims. This one too is part of a series, but one so firmly bedded in the Australian landscape you can feel the hot wind coming off it. 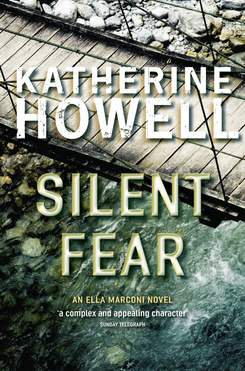 If you've not read any Katherine Howell, take the opportunity to look for one by her. Check what others have chosen for the letter K this week. Bath detective Peter Diamond takes on the most dangerous assignment of his career when he goes in search of the Somerset Sniper, a killer who is targeting policemen in West Country towns. After a constable from Diamond’s own police station is murdered in the small hours of a Sunday morning a desperate hunt follows. Action, menace and courage in the face of extreme danger are the driving forces of this story laced with the surprises that always lie in wait in a Lovesey novel. When Peter Diamond says he suspects the Somerset Sniper is actually one of their own, his investigating team all but turn against him. When he asks them to check duty rosters for coincidences, his lieutenant refuses and Peter ends up doing it himself. For Peter it is a pretty eventful case: he gets shot at; mown down by a motor bike; and attacked by someone who should be on his side. But nothing stops him, and despite his injuries, and the fact that his team thinks he's on the wrong track, his mind keeps working. He proves yet again why he is at the top of his game: he sees connections no-one else does, but he isn't always right. Another very readable tale. 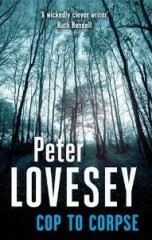 I think Peter Lovesey is incapable of writing a bad one, particularly if you delight in police procedurals like his. And look, if you haven't read a Lovesey before, start with this one. It'll get you hooked! And then there are 10 earlier ones in the Peter Diamond series that you can try. So how will they go with today's letter, the letter K? First published in 1952, the novel was adapted by MGM in 1964, and released as 'Murder Most Foul'. The character of Hercule Poirot was replaced by Jane Marple, played by Margaret Rutherford. In 2008 David Suchet starred as Poirt and Zoë Wanamaker as Ariadne Oliver in the ITV production. Now retired, Hercule Poirot does not have enough to keep him busy. The only important events in his life are his three meals a day, and so when Superintendent Bert Spence, who he met on an earlier case, comes to see him about the McGinty case he welcomes some activity. James Bentley has just been found guilty of Mrs McGinty's murder but has not yet been sentenced. Superintendent Spence is not happy that Bentley is really guilty and asks Poirot to retrace the investigation. The problem with Bentley is that he is such a hangdog that he looks guilty and Poirot thinks that he can't blame the jury for their verdict, but he doubts that Bentley could kill anyone. Poirot goes to stay in the village of Broadhinny and puts it about that there is new evidence come to light that Bentley may not have committed murder after all. As Poirot questions those Superintendent Spence has already questioned, new evidence does indeed come to light. Someone tries to push Poirot under a train so he knows he is on the right track, but he is not quick enough to prevent another murder. Ariadne Oliver is chagrined to learn it has taken place under her very nose. This is a carefully woven plot with Poirot trying to track down the identity of four women whose photos appeared in the local paper. There are several likely people and we see an idea surfacing that was used in an earlier novel, that so many people lost their identity papers during air raids and dislocation during the Second World War, that you can never be sure that people are who they say they are. Poirot again gets a young woman to assist him in his investigation, and in the final pages we glimpse him indulging in some matchmaking. A good read, but I really can't go along with Miss Marple replacing Hercule Poirot (see Synopsis). See what others who are contributing to this week's edition of Pattinase's Friday's Forgotten Books are up to this week. The third novel in the fantastic Detective 'Kubu' Bengu crime series is set in the southern Kalahari area of Botswana - a place full of buried lost cities, incredible hidden wealth, ancient gods and, for thousands of years, home to the nomadic Bushmen. When a fractious ranger named Monzo is found dead, fallen into a donga - a dry ravine - surrounded by three Bushmen, the local police arrest the nomads. Detective 'Kubu' Bengu is on the case, which reunites him with his old school friend Khumanego, a Bushman and now an advocate for his people. Khumanego believes the arrests are motivated by racist antagonism from the police, as the Bushmen are claiming that they were at the murder scene because they were trying to help. Soon after Monzo's death, Detective 'Kubu' learns of another case involving two botany students on their way back from a specimen-collecting trip but who were later found dead, seemingly poisoned, at a campground. Could the deaths be connected? I have realised as I write this review that I have missed out on reading #2 in this series (THE SECOND DEATH OF GOODLUCK TINUBU). I reviewed the first A CARRION DEATH in 2010 and really did mean to read #2 - I'm sure I have it somewhere.. I have really enjoyed DEATH OF A MANTIS. 'Kubu' Bengu has grown dramatically in stature as a detective and is held in high regard by the Botswana police force. Kubu still acts impulsively, makes decisions that are not always wise - in fact one puts his life in great danger. But now he has family responsibilities: a wife, a baby girl. DEATH OF THE MANTIS is one of those books that makes the reader think. For a start - who is "the Mantis"? One of the themes is the conflict between modern Western-style life and the indigenous culture of the Bushmen of the Kalahari. How far will the Bushmen go to preserve the old ways, to keep the sacred places hidden, and yet at the same time how do they pass on their culture? Kubu is torn because one of his best childhood friends is a Bushman although Khumanego says he is trying to preserve the old ways by being an advocate for his people. There are many reminders too that this is a dangerous land that Kubu is living in. 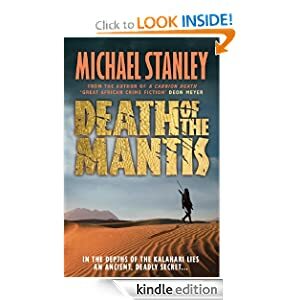 DEATH OF THE MANTIS is tightly plotted, has excellent character development, as well as passing on to the reader a great depth of information about Kalahari life. There's an interesting juxtaposition of technologies too - old maps and records, overlaid by GPS printouts. Check what the authors have to say about the background to the book. You can also read the Prologue and the first chapter there. .one of four novels selected for the short list for Best Genre Fiction at the Minnesota Book Awards in 2012.
one of five nominees for the Edgar Award from Mystery Writers of America for best paperback original in 2012.
chosen by LIBRARY JOURNAL in the US as one of their top ten new mysteries for 2011. 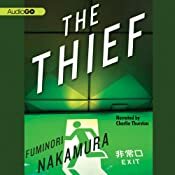 But he does have a past, which finally catches up with him when Ishikawa, his first partner, reappears in his life, and offers him a job he can’t refuse. It’s an easy job: tie up an old rich man, steal the contents of the safe. No one gets hurt. Only the day after the job does he learn that the old man was a prominent politician, and that he was brutally killed after the robbery. And now the Thief is caught in a tangle even he might not be able to escape. From a Western point of view, this is an unusual story told from the thief's point of view. The first signs that things may not be well are the things that appear in his pockets that he doesn't remember lifting. Has he in his turn been the victim of a skilled pickpocket? He has been a thief all his life, always coveting the treasures other children had, and gradually perfecting his techniques as a pickpocket. He specialises in replacing the wallets after he has removed what he wants, so the victim does not immediately realise his cash has been taken. He is alarmed when he meets a boy who shoplifts with his mother and who is setting his sights on life as a pickpocket. He tries to divert the boy, at first refusing to show him any techniques, and then by giving him money to adopt a better life. The murder of the old man in the house robbery leaves The Thief ensnared in a trap where he is required to steal to order. Failure to carry out the thefts will result in his own death and each task gets harder than the last. He realises he may not be around much longer. Many other reviewers have commented on the gritty view the novel gives of the underbelly of Tokyo life. It is a surprisingly short audio book, but is apparently unabridged although Amazon says the hard back version is 304 pages. 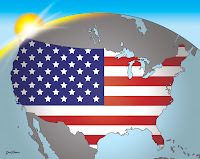 At first I was put off by the narrator's American accent, but then became used to it. On Monday I gave you the list of titles that had been mentioned more than once by my 15 or so contributors in their list of 150+ titles. Yesterday the list consisted of authors mentioned for more than one title. Here today is the full list in alphabetical order of title with year of publication included where I was given it. Yesterday I gave you the list of titles mentioned more than once by contributors. Today here is the list of authors with more than one title. Of course that may simply mean that one of the contributors began reading all available from that author, but see judge for yourself. Of course, not all the books listed are recently published (e.g. Agatha Christie and Wilkie Collins have definitely stood the test of time), but most are. Tomorrow I'll give you the full list. My choice for the letter J is Jo Nesbo whose name appears twice on my list of books this year. Click on the image to go to his website. Set in Oslo, the novel's central character is Roger Brown, a highly successful corporate headhunter. Roger Brown, the headhunter who has never nominated a candidate for a job he did not get, who if necessary manipulates, forces, levers and rams the candidate in, who has clients who trust his judgement implicitly, who without a moment’s hesitation place their company’s fate in his – and only his – hands. To put it another way, it was not Oslo Port Authority who appointed their new traffic director last year, it was not Avis who appointed their Scandinavian director and it was quite definitely not the local authority who appointed the director of the power station in Sirdal. It was me. Roger's problem is that he leads a lifestyle that demands an income well beyond what he actually earns, but Roger has come up with a ploy by which he supplements his income by stealing from the people he interviews. A Harry Hole book. An interestingly structured, but very noir book, with the dominant narrator a boy who is already dead. And a rat with a problem. Visit the meme page to see what others have chosen for the letter J. Also available on Amazon (including Kindle) - click on the link to read a sample of the text. This book is of special interest to Australians because it is based around the Bali bombings of October 2002 when 202 people, (including 88 Australians, and 38 Indonesian citizens) were killed when 3 bombs were detonated, two at Kuta and one in Denpasar. The irony of the story is that while the police are hunting down those responsible for mass murder, Inspector Singh and Bronwyn Taylor, an Australian Federal Policewoman, are deployed to hunt down someone who used the bombing to cover up a homicide. No-one expects Singh and his offsider to succeed for both are held in pretty low regard by their colleagues. The plot is a clever mix of fact and fiction, with some of the characters' names resembling those eventually convicted of the bombings. The author does a good job of describing why the bombings happened, how ordinary people were caught up in them: the bombers themselves, the ex-pat community, the Balinese economy and people. 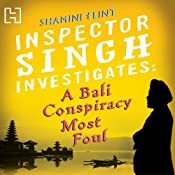 I liked the fleshing out of Inspector Singh much better than in #1 in the series. Bronwyn Taylor, the Australian policewoman, comes over well as both compassionate and conscientious, and she and Singh make a good team. I thought too that the author captured the flavour of Bali very well, although I have to admit it is 35 years since I was there. Time for another holiday I reckon. Narrator Jonathan Keeble does a good job with a range of accents including some dreadfully flat Australian ones. I have managed to collect mid-year lists from about 15 contributors and ended up with 156 titles, some of which are duplicates. Today's list contains the "top" 14, and you will see there is one clear leader. The number at the beginning of the line is the number of times the title was listed. Tomorrow's list will give you the authors mentioned for more than one title, and then on Wednesday I'll list all the titles. Many thanks to those who have participated so far this year. We have an average of about 14 participants a week. 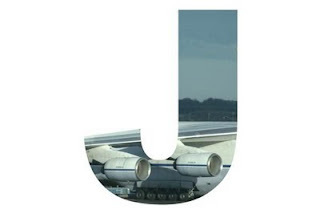 There are some tricky letters to come although this week's letter J is probably fairly easy. Meet the cast of Jubilee Terrace, one of the most popular soap operas on British television. Recently, however, long-standing cast member Vernon Watts, died suddenly of a heart attack. Terrible as his death was, the production team was quick to make the most of the opportunity. As news of Vernon's demise spreads, the show's bosses decide to bring back an old character. The infamous Hamish Fawley is all set to return, despite the disapproval of the cast. But when a suspicious letter emerges raising questions about Vernon's death and an arson attack kills two more of the cast, it would appear something sinister is afoot. An interesting plot, but the audio version is made all the more confusing by the fact that there are two sets of characters: the actors in the soapie, and the characters themselves. Some of the actors prefer their soapie personas. I think the author struggled with this duality. The plot idea was a good one but juggling with about 20 personalities must have been a real challenge. 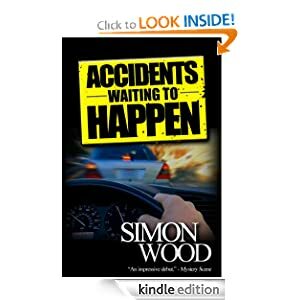 The plot gets an extra twist when one of the people thought to have been killed in the arson attack reports for work as usual and the reader has to cope with some huge very red herrings. Gordon Griffin the narrator does an admirable job with the voice differentiations required. 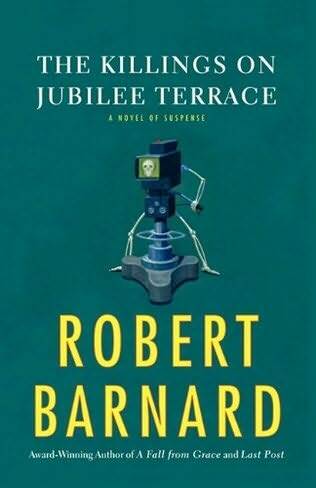 The detective in THE KILLINGS ON JUBILEE TERRACE is Charlie Peace, although interestingly Fantastic Fiction does not include it in the Charlie Peace series - surely an oversight..
Radio Broadwich comes to Twytching to do a documentary about the town. Debra Withens, the town chairman's wife, assumes she will be pivotal in choosing who will be interviewed. Alison Mailer on the other hand is just as determined to be the determiner. Suddenly accusing letters are delivered to the locals and then there is death. A rather enjoyable cosy, well read by Christopher Scott. Police Inspector George Parrish makes an interesting central investigator. The very elderly Professor Belville-Smith from Oxford is contributing to the education of antipodean students of English with a lecture tour to Australia. Basically he is delivering the same lectures for which he gained a reputation 50 years ago. However someone at Drummondale, an outback New South Wales university town obviously doesn't like him and he ends up dead in his motel room with his throat cut from ear to ear. Local police inspector Royle has to interrupt his weekly schedule of local cuckolding to investigate the death. This was Barnard's first novel and apparently based on a sojourn he had in Australia. It is semi-satirical and contains some very unkind observations about Australian life in general. It evoked both annoyance and cultural cringe in me. Josh Michaels is worth more dead than alive. He just doesn’t know it yet. He has no idea why someone would try to kill him, clearly that’s exactly what happened. When an SUV forced Josh’s car off the road and into a river, it might have been an accident. But when Josh looked up at the road, expecting to see the SUV’s driver rushing to help him, all he saw was the driver watching him calmly…then giving him a “thumbs down” sign. That was merely the first attempt on Josh’s life, all of them designed to look like accidents, and all of them very nearly fatal. With his time—and maybe his luck—running out and no one willing to believe him, Josh had better figure out who wants him dead and why…before it’s too late. This was one of those very inexpensive buys on Amazon and I am not even now very sure who recommended it to me. Although the author is a "transplanted Brit", it is a very American novel, set in a world where making money however you can is important. Dexter Tyrrell, Vice President of Pinnacle Investments, has come up with one such scheme, but various factors have reduced its profitability recently, and so Tyrell has introduced another factor, designed to ensure profits go up again. But sometimes human factors, like Josh Michaels. destroy the best laid plans. Sufficiently intrigued? Another clue- Josh Michaels, strapped for cash, a few years earlier, cashed in his life insurance policy, for a fraction of what it was worth. Or at least that's what he thought he had done. His best friend Bob is his insurance agent, and Bob, on Josh's behalf, made a viatical settlement. Married now for a number of years, Josh has not always been squeaky clean in either his business or sexual life, and now these elements are coming back to bite him, adding to the complexity of the plot. This is a thriller with many interesting elements. Other reviews to check - Reviewing the Evidence - although beware that some of these will reveal more of the plot than I have. 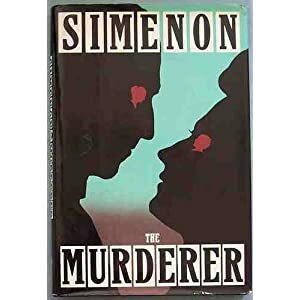 One author that I was already familiar with, available here in Australia in the distinctive green Penguin Crime Classics paperbacks, was Simenon. I don't think that at the time I realised I was reading translated books. Late in 1992 I read THE MURDERER, first published in 1935. Not a mystery in the mode that has made Simenon universally famous, this is a classic psychological novel, issued in France in 1935 but like all other works of merit, timeless. The author's stringent control of his material deepens the reader's feelings for Dr. Hans Kuperus of Sneek, a small town in Friesland. After killing his wife and her lover, Herr Schutter, Kuperus escapes suspicion and the townspeople sympathize with the widower for a time. Then he begins behaving extravagantly, flaunting his affair with his housekeeper and scandalizing the crabbed, insular community in other ways. Finally, the doctor has no practice, no friends; he and the housekeeper are prisoners in his house. Faithfully translated by Sainsbury, the narrative hauntingly describes the disintegration of human beings, damned by weaknesses that Simenon compels the reader to recognize and pity. Last month in my post e-books holding steady I commented that about 75% of readers of my blog read e-books in one form or another (on an e-reader, their iPad, or computer). This figure has been pretty consistent for the last 12 months. The poll I have been conducting for the past few weeks mines a bit deeper and has a few more respondents. Again the significant statistic is around 75%. 24% of the respondents have bought no e-books, so presumably most of them have either not purchased an e-reader or have abandoned using it. I read about 1 e-book in every 2 books. "I am totally hooked to my Kindle. While it was a slow conversion (about 4 years) I just recently have read solely off my Kindle." "I probably purchased more than five each month. I am an e-book-aholic. In fact, I don't buy any paper books anymore." "I was surprised that your survey only went up to five. 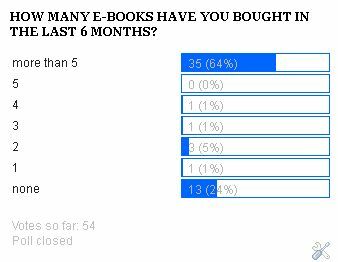 I would say I have read 30-50 ebooks in the last six months"
" I try not to buy any paper book if it's available in electronic format." 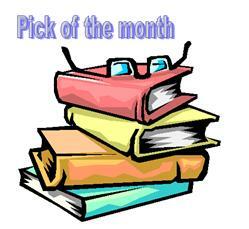 "I generally alternate, a print book then an ebook, its just the way my schedule works." So why are we (crime fiction readers) so hooked on e-books? (3) Affordability. I buy few ebooks that cost more than $9.99. They make books available which might not otherwise be available. ease of instant purchase: I buy my e-book online and I have it on my Kindle only minutes later. when travelling I can take my library of several hundred books with me. but I don't have to be travelling: my Kindle fits beautifully into my shoulder bag for use in the doctor's surgery etc. people who want me to review a book can send me a Kindle file as an e-mail attachment. That's much much cheaper than postage to Australia. Like many of my friends who have e-readers I am convinced that I read e-books faster, probably because, like Joe, I am appreciative of the option to re-size the text. I often mark text that I wish to remember for any review I write. On the Kindle I can download those highlighted bits to my computer as a text file. I can synchronise my e-reading across my Kindle, phone app, and husband's iPad, and move "seamlessly" from one to the other, picking up the book on one device where I left it on the other device. I can listen to my e-book if I want to - most Kindle books have text to audio. Admittedly it is a computerised voice, but I can also attach it to a speaker system so I can listen while ironing etc. So they'll all come from my 2012 Reviews. At least that's the plan which nearly came unstuck this week, when I had a real paucity of Is. Only one in the titles, only one in the surnames but I had already used him in this meme. But just recently I finished my third book for the year by Ian Rankin. 4.7, THE IMPOSSIBLE DEAD, Ian Rankin - and it has the added advantage of an I in the title! So there you are - an author worth checking. 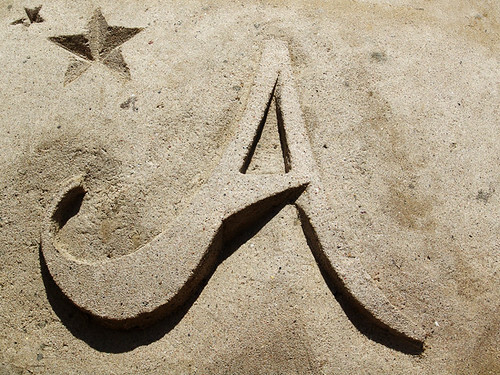 Check out what others have chosen for the letter I. When Eva Mitter is found drowned in her bathtub, the chief suspect quickly becomes her husband of three months, Janek. With no other viable suspects and Janek’s suspicious behaviour, it looks like and open and shut case. Certainly Inspector Van Veeteren thinks so. After all who could believe Janek’s convenient loss of memory as to what happened that fateful night because he drank too much at dinner? But when a second murder occurs that is clearly connected to the first, something about Janek’s protestations sets Van Veeteren rethinking the entire case, and before long finds himself involved in one of the darkest cases of his career. The author's website is worth consulting for an overview of the series, of which THE MIND'S EYE is the first. The series, most often referred to as the Van Veeteren series, takes place in Maardam, a fictitious city in a made-up country that could be anywhere in northern Europe. It follows the murder cases investigated by Chief Inspector Van Veeteren – eventually the retired Chief Inspector – and his two crime squad protégés, Münster and Moreno. The author goes on to describe Inspector Van Veteeren as a "a philosophical detective with a unique ability to draw lines between dots that are far apart and nearly invisible." Certainly in THE MIND'S EYE there are some fascinating descriptions of the Inspector listening to classical music and finding that the elements of the case click into place. The murderer was somewhere out there. One of this town's 300,000 inhabitants had taken it upon himself to kill one of his fellow human beings, and it was the duty of him, and Van Veeteren and all the rest of them, to nail the man - or the woman. It was going to be one hell of a job in fact. They would work for thousands of hours before the case was closed, and when they eventually had all the answers, it would become clear to them that nearly everything they had done had been a complete waste of time. They would realize that if only they'd done this or that right away, they would have cracked it in two days instead of two months. There are many things to like about THE MIND'S EYE: if you are new to the series, you'll have the pleasure of starting with the first in the series; you'll also have the pleasure of getting acquainted with a very likeable detective. He's not young - someone rings the station and asks to be put through to the "grey one". I like the fact that he can admit he has made a mistake. Van Veeteren is empathetic to the victims of crime - he's been where they are now: broken marriage, fragile childhood. There are some truly comic incidents too: imagine him lying on the floor having his back massaged by someone he went to interview. In these days of over long books, THE MIND'S EYE is a quick read. I have a couple of the other titles on my shelves. Must read them! Malcolm Fox and his team from Internal Affairs are back. They've been sent to Fife to investigate whether fellow cops covered up for a corrupt colleague, Detective Paul Carter. Carter has been found guilty of misconduct with his own uncle, also in the force, having proved to be his nephew's nemesis. But what should be a simple job is soon complicated by intimations of conspiracy and cover-up - and a brutal murder, a murder committed with a weapon that should not even exist. The spiralling investigation takes Fox back in time to 1985, a year of turmoil in British political life. Terrorists intent on a split between Scotland and the rest of the United Kingdom were becoming more brazen and ruthless, sending letter-bombs and poisonous spores to government offices, plotting kidnaps and murder, and trying to stay one step ahead of the spies sent to flush them out. Fox has a duty to get at the truth, while the body count rises, the clock starts ticking, and he fights for his professional and personal life. When Rankin introduced Malcolm Fox who works in the Dark Side of the Complaints and Conduct section of Edinburgh's Lothian and Borders Police HQ in THE COMPLAINTS we all wondered whether he was going to replace John Rebus, forcibly retired. The answer I think is that he is a very different character but no less a detective, very largely also a lone wolf, but also more careful to cover his back than Rebus was. The title of Fox's team has been changed from "Complaints and Conduct" to "Professional Ethics and Standards" but their mission is the same: to investigate claims of police corruption. And when they turn up at a police station they are about as popular as lepers: the boss is at head office, no secure interview room available, people to be interviewed are off sick with lingering illnesses or they are so involved in a current case that they can't spare the time. The air of suspicion and opposition is thick and palpable. So Fox decides to interview the person who originally laid the complaint about his own nephew: a former police officer who now runs his own successful security firm, and lives in a difficult to find cottage well out of town. Fox interviews him and finds Alan Carter is investigating the death of a political leader, Francis Vernal, nearly twenty years earlier. Strictly speaking the investigation that erupts when Alan Carter is found murdered and his nephew is taken in for questioning should not be of interest to the Complaints, but Fox can't help thinking there must be connections. His interest is further spiked when he finds a picture of his own uncle with Francis Vernal. This is a carefully layered and constructed tale. We learn more about Malcolm Fox's family and his background, and his relationships with the rest of his team. And it is certainly well written. I have seen reviews whether bloggers have said they prefer the first in the series, THE COMPLAINTS, but I think I enjoyed THE IMPOSSIBLE DEAD as much. 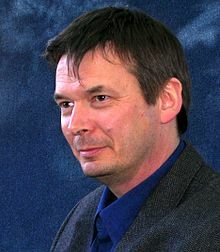 Interview with Ian Rankin by the Guardian about the research that went into the book. Petrona who asks if the central theme has run out of steam. 1992 was a year of discovery for me with me authors, well known now, that I discovered had written a large number of books. many of these I have already focussed on with my "forgotten books" this year. 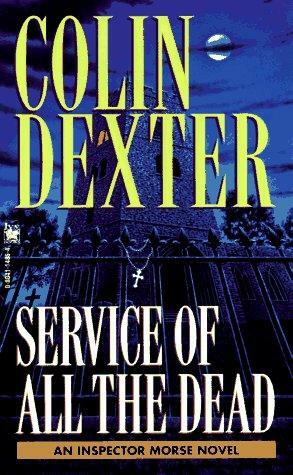 My choice this week is SERVICE OF ALL THE DEAD by Colin Dexter. Published in 1979, this was early, #4, in the Morse series (did you realise there were actually only 13 of them? ), and Dexter became another author I explored in 1992. Chief Inspector Morse, a middle-aged bachelor with a fondness for crossword puzzles, Mozart, and attractive women, investigates a series of suspicious and sinister events at Oxford's Church of St. Frideswide. That doesn't actually tell you a lot does it? Wikipedia tells us a bit more, hopefully not too much. This time Inspector Morse brings the imposition on himself. He could have been vacationing in Greece instead of investigating a murder that the police have long since written off. But he finds the crime – the brutal killing of a suburban churchwarden – fascinating. In fact, he uncovers not one murder but two, for the fatal fall of St. Frideswides vicar from the church tower Morse reckons to be murder as well. And as he digs into the lives and unsanctified lusts of the late vicar's erring flock, the list of the dead grows longer. Not even the oddly appealing woman he finds scrubbing the church floor can compensate Morse for the trouble he's let himself in for. So he has another pint, follows his hunches, and sets out to untangle the deadly business of homicide.